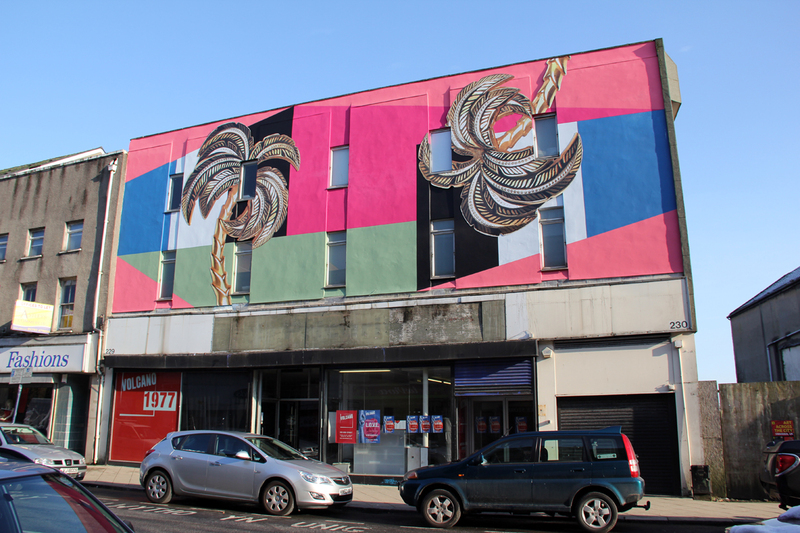 As part of an initiative called Art Across The High Street, funding is being used to create accessible art works in public spaces while also addressing some of the visual horrors that have scarred the high streets of Swansea town from poor architectural decisions. The first of these public works is by artist Sinta Tantra whose work was displayed as part of the 2012 Liverpool Biennial. Tantra’s work for the Biennial displayed a desire to play with the form of those objects often taken for granted, namely buildings. By subverting their use, simply as a space to house things such as business and galleries, she provides new meanings to the physical nature of the buildings by adding colour, shape and light to their surfaces, hoping to explore the roles of public imagery and space. Together Yet Forever Apart (2012) was adorned to Open Eye Gallery’s outer walls adding colour and vibrancy to the strict and defined Mann Island area. Tantra’s piece on Swansea High Street, Greater Reality of Elsewhere works in a slightly different way. Whereas Mann Island in Liverpool is an area born from the very heart of social development, Swansea High Street is in a different situation. The road is on a smaller scale, the buildings are mismatched, some period and some new builds. The walls of the building that Tantra’s work adorns are a grey pebbledash; a scar from the 1960’s attempt at redevelopment. Whereas Together Yet Forever Apart was adding colour to the overly serious business space (the same for the piece Tantra produced for Canary Wharf) Greater Reality of Elsewhere appears to be providing a lifeline for a road straining under austerity. The piece has Tantra’s usual colourful flair with some added palm trees questioning the relationship between geography and identity but there is more to it than playful colour. The very name of it speaks to its passersby, not of a potential for a better area away from its location, but of the potential for a better area to be reborn on the very street itself. Gone is the grey pebbledash with its imposing lethargy hiding the many that are balanced on the breadline and instead a light at the end of the tunnel, a spark hoping to catch a light. Greater Reality of Elsewhere isn’t there to transport the viewers out of the reality of the run down high street but to show that, like many of the areas in need of regeneration, they’re only in need of some care and attention. The colour of the work is “cut rather than filled” giving the building an effective new skin giving a new identity for the viewers passing by. Like her other work, it questions how people view art, not just as a visual stimulus, but as an occurrence in everyday life; an unplanned viewing that can lighten up a grey day. Glad you enjoyed it Andy. Hope Art Club is going well!